The state transportation agency didn’t mince words about what drivers should expect when crews begin work Thursday on the next phase of the long-anticipated Commonwealth Avenue Bridge project. Dear Massachusetts Department of Transportation, thanks for your brutal honesty. 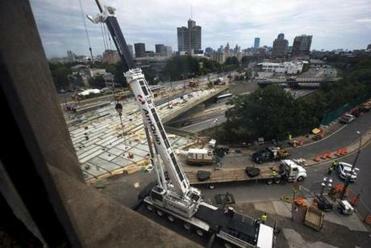 In a message displayed on electronic highway signs around the Boston area this week, the state transportation agency didn’t mince words about what drivers should expect when crews begin work Thursday on the next phase of the long-anticipated Commonwealth Avenue Bridge project. A driver managed to get a photograph of the warning while traffic crawled slowly along the interstate, and shared it with the Globe. The massive Commonwealth Avenue Bridge overhaul project, it turns out, won’t be a complete catastrophe for all commuters involved. Patrick Marvin, a spokesman for MassDOT, confirmed that the signs are out there, and said similar messages will be displayed for drivers in the coming days as the project gets underway. Starting Thursday, MassDOT will begin the process of replacing the westbound side of the Comm. Ave. Bridge. Construction is expected to last through Aug. 11. During that timeframe, commuters of all kinds — less-so for pedestrians and cyclists — should anticipate major impacts along Comm. Ave., the Massachusetts Turnpike, the BU Bridge, the Green Line, and areas around the project site. The humorous message spotted by drivers this week appeared on 20 digital signs throughout the Boston area, Marvin said. He said MassDOT is “committed to informing travelers of the upcoming major travel impacts” to all modes of transportation while the bridge is being replaced. 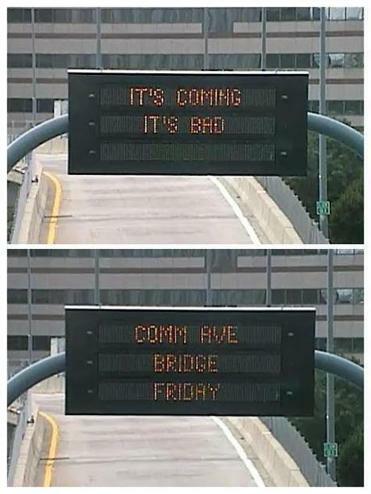 This isn’t the first time MassDOT got creative with messages for drivers along the interstate. In 2015, the agency posted holiday-themed witticisms on the highway signs, to remind drivers to pay attention. And of course, there was the message that kicked off the use of jokes to inform drivers of the rules of the road, which went viral in 2014: “Changing lanes? Use yah blinkah,” it read.